Going somewhere? We’re packing in all the deets about which smart wardrobe essentials we know you’ll want to have with you wherever this busy travel season takes you. Start your holiday right by breezing through your travel itinerary with effortless style, flair and comfort. Keep reading to get your passport to style stamped and ready for take-off. Keep scrolling to see what you should wear on a plane! Destination picked? Flight booked? Suitcase packed? Now it’s time to figure out what you’re going to wear while you travel. 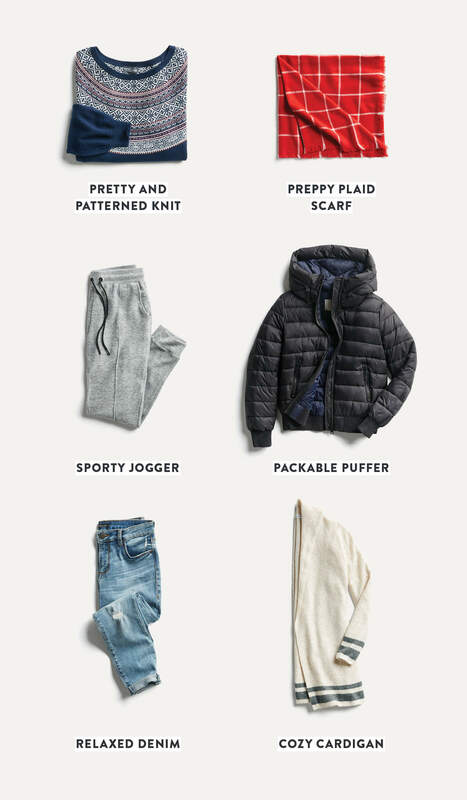 We have 6 essentials that we like to travel with—think of these items as your building blocks for what you should wear on your next flight. The most no-fuss top to wear on a plane? A classic, long-sleeved knit. 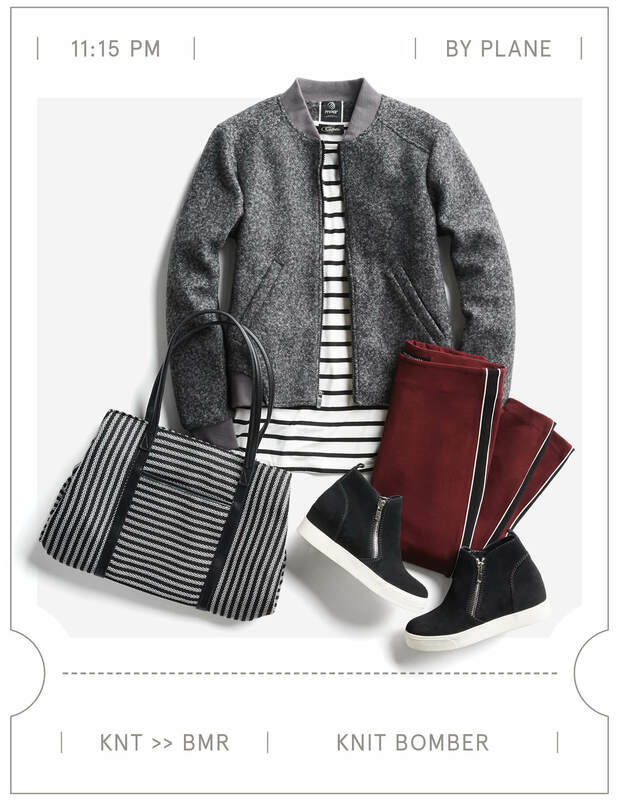 We like to reach for a set of classic stripes that we can pair with anything from jeans to leggings (which you can bet we’ll be wearing on the plane!). If you’re a fan of taking in-flight naps, grab a blanket scarf to wrap around yourself to keep warm as you travel to and from your destination. Plus, they’re lightweight enough that they won’t weigh your carry on down. We can’t emphasize this enough—comfort is key! A pair of stretchy joggers are perfect for the plane—so sit back, relax and chill. Need a versatile plane jacket? Puffers have you covered for your winter travel needs. Warm on and off the plane, just layer it on and go! If you’re a fan of looking a little more polished as you step into that TSA line, try out a pair of jeans for your flight. Wear them with a simple sweater and slip on flats or sneakers and you’ll breeze through security. If you’re the type who’s notoriously cold, a chunky knit cardigan is the way to go. Need even more warmth? Layer it up under your puffer jacket. Go ahead, make the airport your runway. 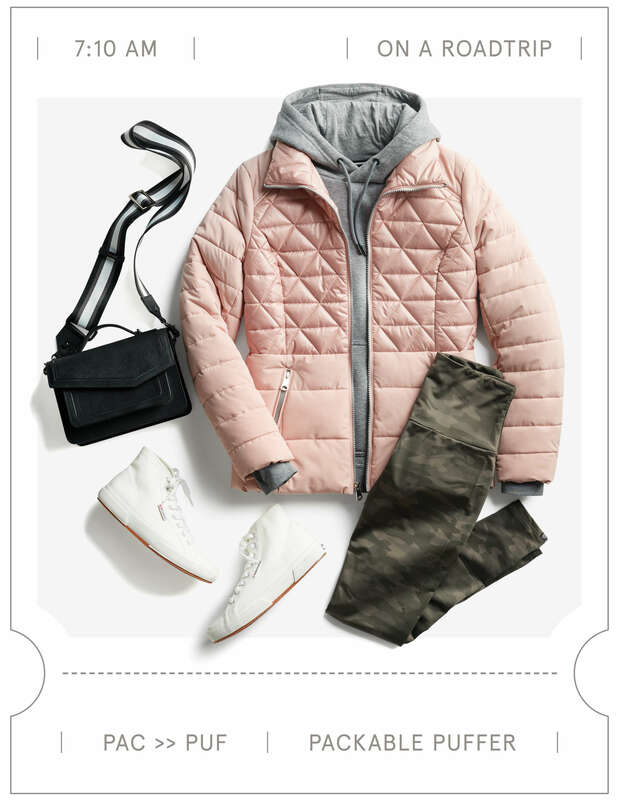 A knit bomber with rich-colored, sporty leggings and wedge sneakers strikes the right balance when it’s time to soar through the friendly skies or run to the terminal. Easy to wear slip-on shoes are our favorite for security checks (no one likes to deal with laces!). Don’t forget the oversized tote to pack your snacks, sunglasses, travel pillow and blanket. Go classic on your getaway with friends. 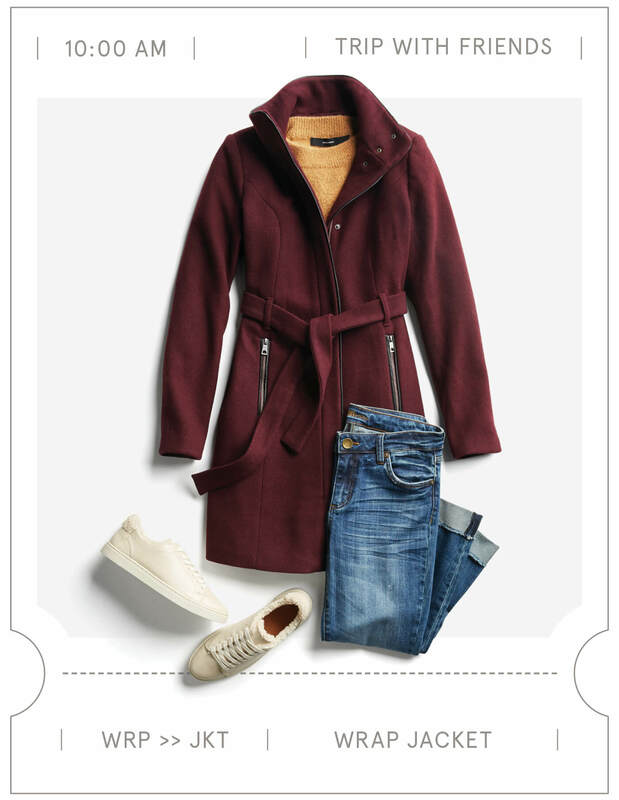 A wrap jacket is the cozy, travel chic staple you need to tie your look together. It not only keeps you nice and toasty, but looks great with jeans at a casual dinner or fancy it up with a dress, tights and stack-heeled ankle boots for a night on the town to catch up with old (and new) friends. A seasoned snowbird knows how to escape frosty temps without looking extra touristy on the way to sunnier skies. 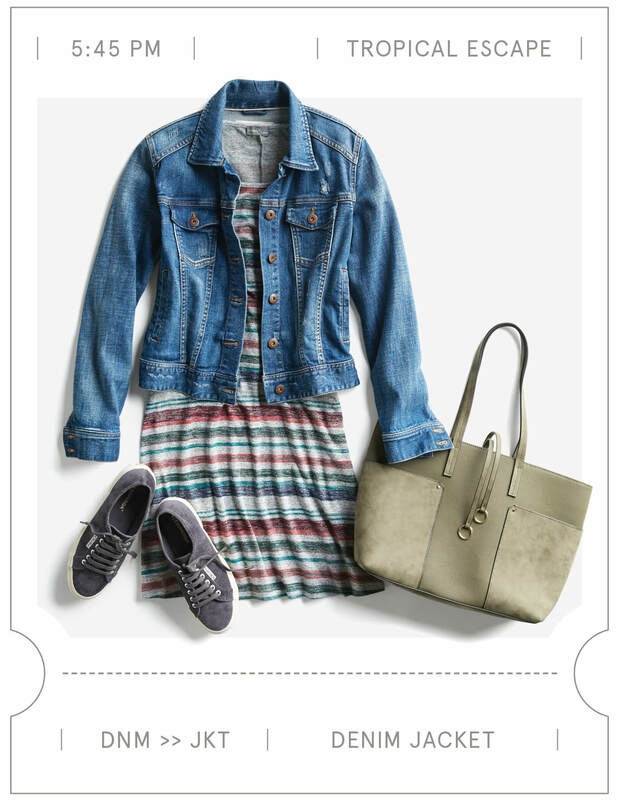 Go for ease and flow, in a stretchy, striped dress that swings as you move and a cute denim jacket. It’s a look that says flawless getaway. Serve a look that says you mean business when you step off the plane and into the boardroom. A trenchcoat is a frequent business traveler’s best friend. 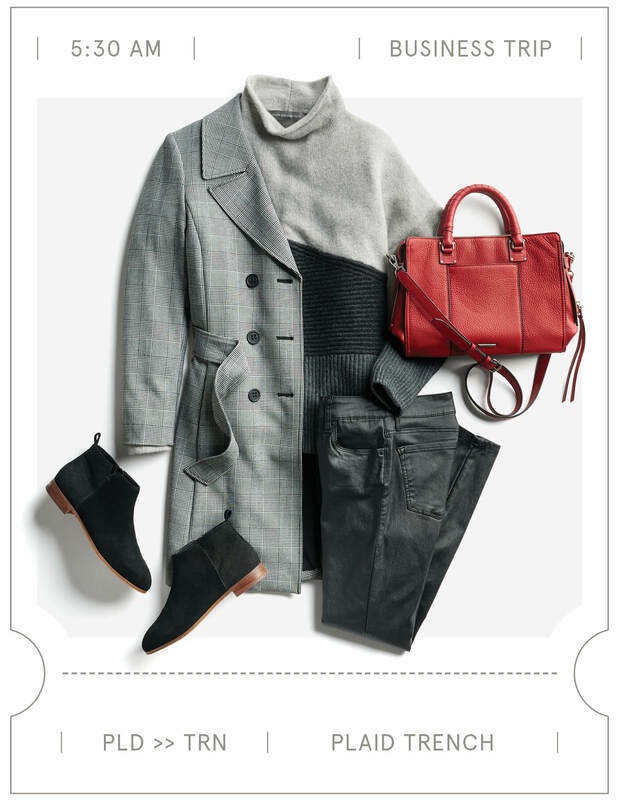 With a suit and heels or heavier knit layers, like a mock neck pullover and dark jeans, the trenchcoat is your easy, comfortable go-to. It’s light and can fold down compactly in a suitcase—plus, it’ll keep you covered on rainy days. All your fashion dilemmas are handled—Olivia Pope style. Truck-stop chic is a definite go! Not your average sweats—leggings are sleek, yet functional, making them a prime choice for sitting in the backseat en route to your holiday destination. Wear them with cute high-top sneakers and snug layers that you can pile on or pull off, depending on how your driver likes their A/C. Plus, a packable puffer makes the perfect pillow or headrest for a traffic jam nap. 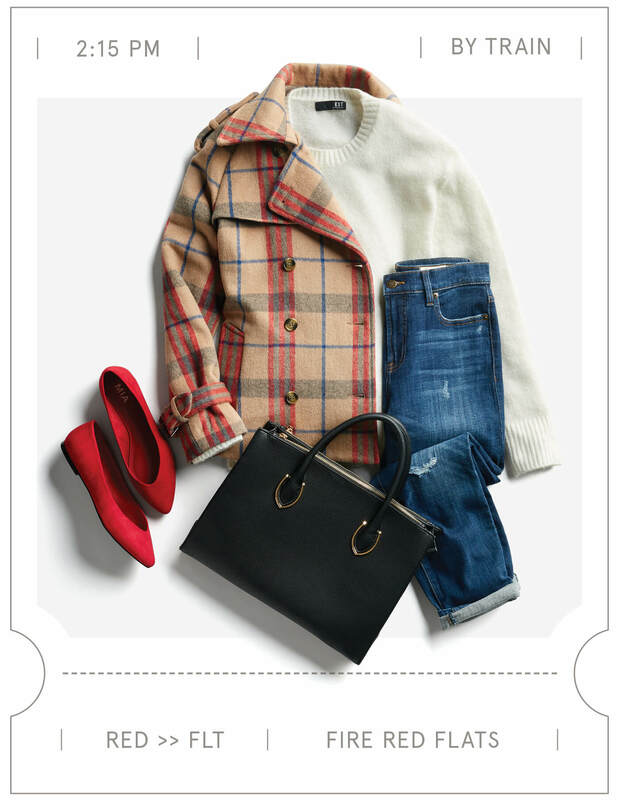 Bright and comfy flats with relaxed-fit jeans and a double-breasted patterned jacket are a runaway hit when traveling by train. No roads, no traffic, no wardrobe woes. Just miles of style and scenery. Ready for a perfect outfit for the plain, train or automobile? Schedule a Fix and let us know where you’re headed!